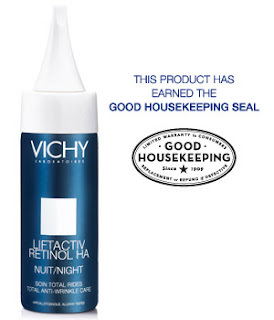 Inspired by the latest dermatological fillers, LiftActiv Retinol HA Night contains fast acting retinol and a triple dose of hyaluronic acid for visible results starting in just 4 days, not 4 weeks. This advanced plumping treatment contains triple dose Hyaluronic Acid for a deeper, more stabilized filling action, and new generation Retinol for an accelerated resurfacing effect. Plumping effect visible from the 1st morning after use. 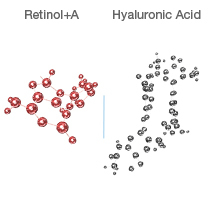 Triple Dose Hyaluronic Acid for an intense, stabilized filling action + New Generation Retinol (Retinol+Adenosine Complex) for an accelerated resurfacing effect. Patented double-gelled-phase formulation provides nourishing yet light and smooth texture. Plumping effect is visible from the 1st morning after use. Anti-wrinkle effectiveness lasts for up to one month after stopping the product use. Self-assessment by 52 women aged between 45 and 65 years after 8 weeks of daily use. *Clinical test conducted on 52 women. Results measured by a dermatologist. Allergy-tested. Tested on sensitive skin under Dermatological control. Non-comedogenic.